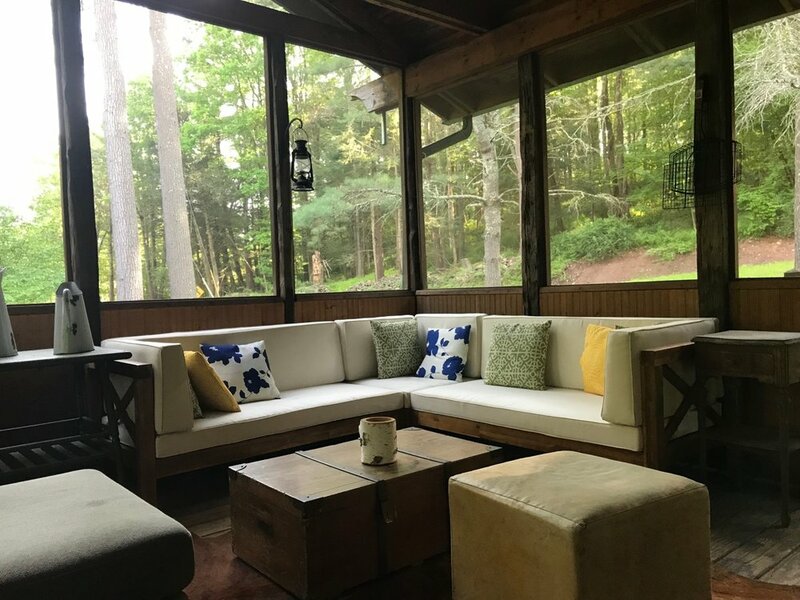 Reason to rent: In season, the large screened porch serves as the defacto living room, and during chillier months, nesting by the wood stove or hitting the hot tub. A rustic cabin on the outside, with bright, renovated cottage within, guests arrive via gently winding country roads, passing farms along the way, and spy the Adirondack siding and charming screened-door entrance of the Old Campbell Place. In summer, the large porch is both lounge and dining room, and serves as the heart of the house. Wintertime use serves as a handy spot for dropping snowy boots and layers of outerwear before passing through the French doors into the house proper. The open plan space combines high, beadboard paneling, with comfortable, contemporary furnishings. The cute and efficient kitchen, with plenty of utensils and cookware, has open shelving and a gas stove, with dining table nearby. Then a couple of sofas in the living room area, near the glass-fronted wood stove, will be where you gather, lounge and connect. Down the hall are three bedrooms: a full and two queens. The beadboard-paneled bathroom includes a mini-clawfoot tub with shower and vintage sink. 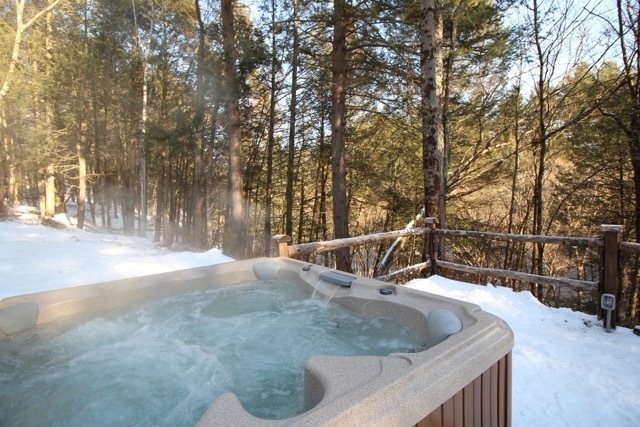 Though the house is proximate to the quiet country road, there are 13 mostly wooded acres to explore, starting with the backyard, which features a deck in the sun and hot tub under the stars. 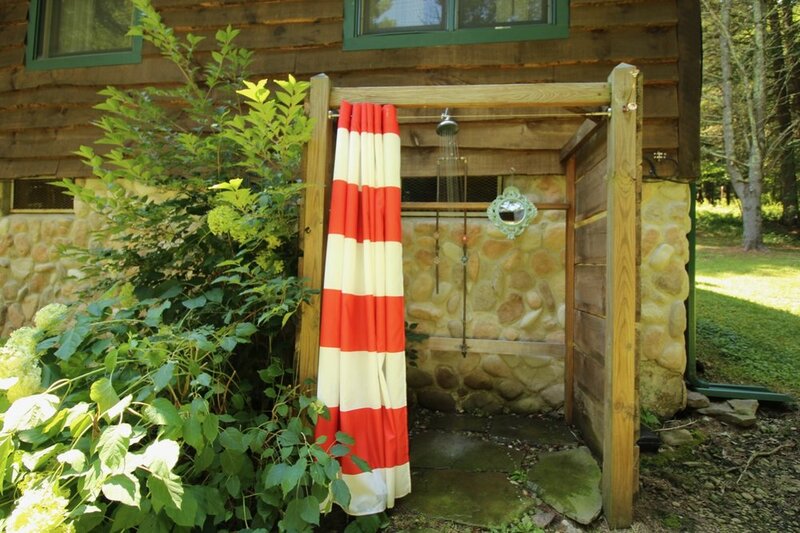 The outdoor shower (seasonal) is always one of those oddly pleasing experiences that reminds you you've veered away from your normal routine. Step into the woods, and a charming series of steps with branch railings, leads down the ravine to the tumbling waters of Callicoon Creek. The stream has shallow runs, perfect for little tykes who will thrill at throwing stones that plonk into the water, and occasional deeper pools, including one that can be plunge-depth, depending on recent rainfall. But in all seasons, with the wild-growing rhododendron flourishing throughout, the time spent by the creek will be some of the memories you will most relish. 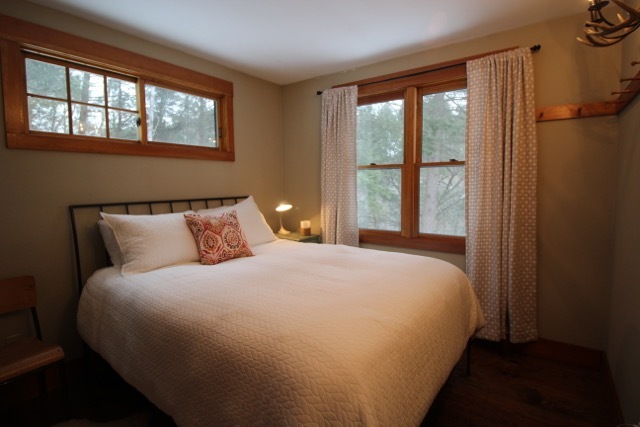 Old Campbell Place is convenient to both North Branch and the town of Callicoon. 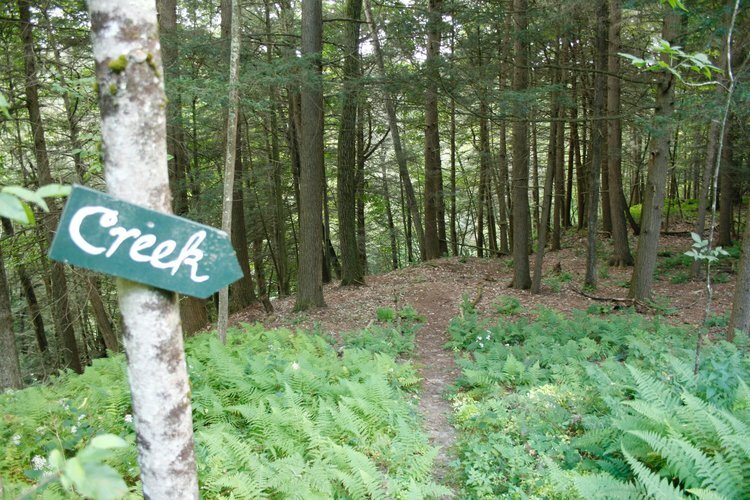 Fishing access to Callicoon Creek is less than 2 miles from the house.